I wasn't sure if I was going to bother posting this recipe or not, but decided that these muffins were pretty good despite my attempts to mangle them. This is one of those times where I both intentionally and unintentionally meddled with a recipe, yet it still managed to come out pretty well, if not a tad ugly. 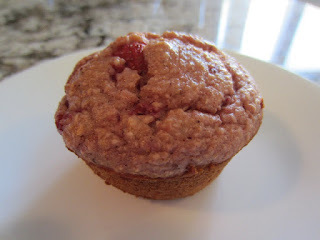 It's a relatively quick and simple recipe, which I was mostly drawn to as a way to use up some leftover strawberries, not to mention that it had been a while since I made muffins. I was also pretty happy with the fact that they were lighter than the average muffin, so you don't have to feel bad if you eat more than one (or two). 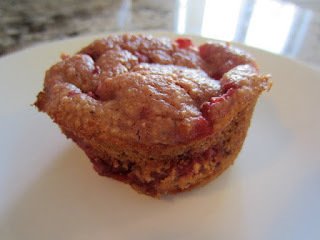 A recent infatuation with strawberries and cinnamon prompted me to add cinnamon to this recipe. I also switched the sugar to brown and made a little reduction. And then I decided to change the process a little bit, adding some mashed strawberries to the yogurt before mixing everything together. However, the ability to do this was likely granted by some of my unintentional changes. First, I outright forgot the eggs. I'm not sure how, but when I went to make some notes afterwards, it occurred to me that I had no recollection of ever cracking an egg. It amused my brother to discover that I can still make mistakes like this (EGGS!?). My second unintentional change was that I doubled the amount of strawberries. Somewhere between the strawberry pie and the day I made these, I had forgotten that I had purchased one quart containers of strawberries (4 cups) rather than one pint (two cups). Le Sigh. These two oversights (honestly... I forgot eggs?) led to the muffins being a little deflated. Any rising in the oven was quickly lost once the muffins were taken out. Thankfully, these things don't have any effect on flavour. The muffins were tender and moist, with strawberries all over the place (obviously). They were just lightly sweet, perhaps even a little bland if you only got the "cake" part in your bite, which wasn't very often. Most of the time you get a lot of strawberry flavour, a hint of cinnamon, and the taste of oats to round it all out. These muffins will live and die by the quality of your strawberries. If you end up with a bad batch I definitely wouldn't recommend you make these, unless you want to add a bunch more sugar to the recipe. Overall the muffins are a happy mistake, I really couldn't imagine them with less strawberries. 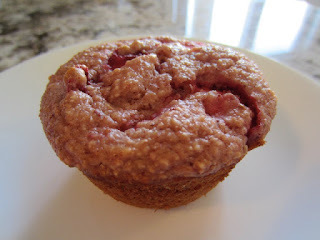 It's likely that you're not going to impress anyone with their looks but it's even more likely that at around a hundred calories a muffin, no one is really going to care :). 4 cups strawberries, cleaned and quartered. Preheat oven to 400F and lightly grease a standard 12 muffin pan. Add oats to a food processor and grind until fine. Add brown sugar, baking powder, cinnamon, and baking soda to food processor and run until completely combined. In a bowl mash approximately 1/3 of the strawberries. Add greek yogurt to mashed strawberries and mix until combined. Add eggs and mix until combined. Distribute batter evenly in prepared muffin tin and bake for 15 to 20 minutes or until tooth pick inserted into muffins comes out clean. Allow to cool in pan on rack for 10 minutes before removing muffins and allowing to cool on rack. The low fat muffins I have listed could probably be called low calorie as well, but since these had 2% greek yogurt, they were less low fat then the low fat ones. Not to mention that I didn't want to call them healthy, because there's nothing "healthy" about them, though they are "healthier." Low calorie just seemed the best fit for what they are, plus you're willing to make concessions on flavour when you call something "low cal" :), which these somewhat do. Not that I wasn't happy with them, those are just the facts. And though I will agree that muffins in general aren't winning any beauty competitions, these ones are exceptionally fugly :). Greek yogurt might be the second best substance on the planet, underneath peanut butter; but I have made no final decisions :).